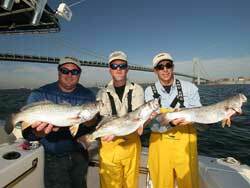 The rod and reel combo we recommend for deep water weakfish should be capable of handling 20-30lb braid. The rod should be 6’6″ to 7′ with a fast to extra-fast action. Levelwind reels are certainly easier to use, but may present a handicap when dropping the bait down during a fast drift (because the line goes out more slowly). Do not be confused by the suggested lure weights specified on the rod blanks. These weights pertain to the size of lures that can be cast effectively using that rod. Much heavier weight can be used when simply dropping to the bottom or flipping the rig away from the boat. The reel should be loaded with 20-30lb braid. The heavier braid is preferred when fishing with the larger 4oz bucktails or bouncing sinkers 4oz or larger on the bottom. Since braided lines have a thinner diameter and less water resistance, they provide an added advantage and allow the angler to hold bottom with lighter sinkers. The lack of stretch transmits even the softest of hits back to the angler. The rig consists of a 3ft length of 30lb fluorocarbon leader attached to the main line using a 75# barrel swivel. The other end of the leader is attached to a 3-way swivel. A 3-6oz bank sinker is tied 2ft beneath the 3-way swivel. The rig is completed with a 3/o beak baitholder style hoook on a 3ft length of 30# fluorocarbon leader. A 2-4oz bucktail can be substituted for the bank sinker when using artificial soft-baits. Live peanut bunker or snappers (baby bluefish) are effective but not very durable. Artificial shrimp, sandworm, mullet, grub, and squid soft-baits are universally effective. These baits can be fished on the 3/0 hook or used to tip the bucktail. The bucktail can also be tipped with a variety of artificial soft-baits. The artificial shrimp and squid can especially effective when those baits are presents.